In the left panel of the triptych Actaeon appears on horseback, an intent figure who has the blonde hair and ruffled shirtsleeves of a Disney prince. "I'm a grown up girl," Staver explains, "and creating fairy tales give us the ability to fulfill our fantasies. 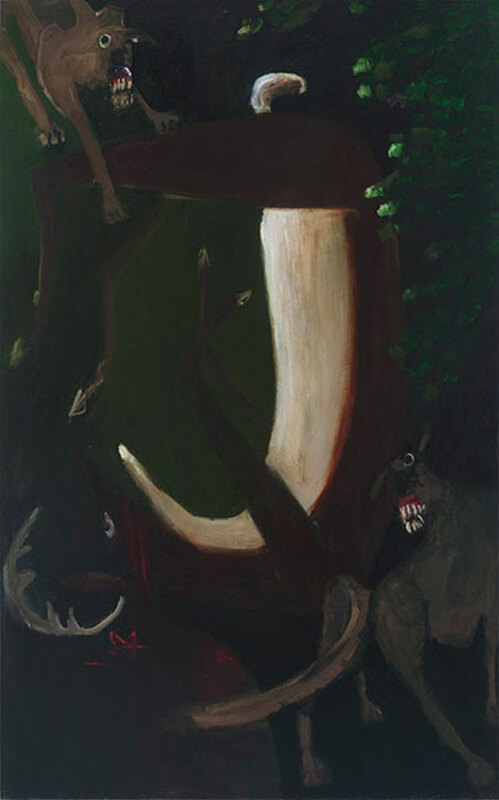 As I painted Actaeon I asked myself: who would he be?" 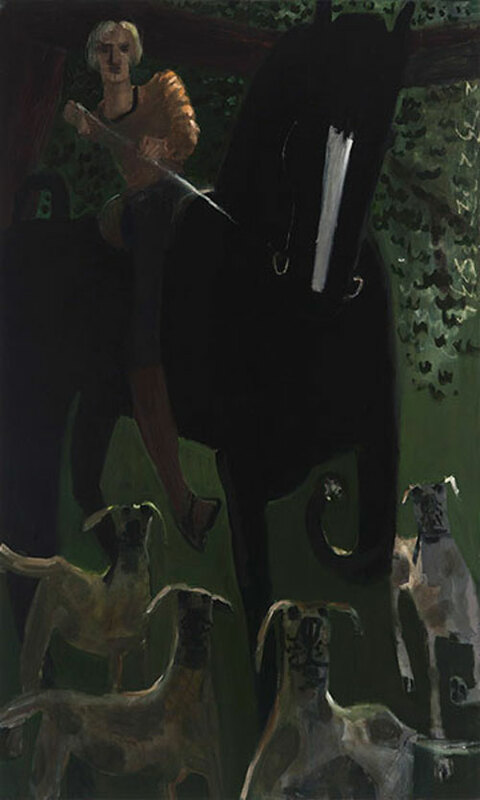 Mounted on a dark stallion and surrounded by his loyal dogs, Actaeon just has been stopped in his tracks by the accidental revelation of Diana's beauty. He is part hero, part tragic figure, part cliché. In the third and final image, Actaeon -- now transformed into a stag with one splash of Diana's bathwater -- is torn to shreds by his own dogs. 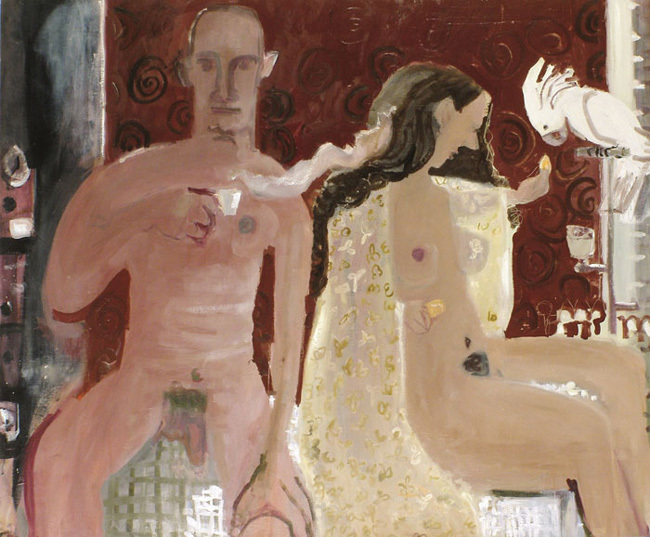 It is the most abstract and ambiguous of the three scenes. Since Staver feels that humor is a necessary element that can be mixed with tragedy, the image is also just a bit funny. The dogs, who have morphed from loyal hounds in the first panel to snarling assassins in the third are intentionally cartoony, even absurd. "For me," Staver notes, "there are even elements of humor in Picasso's Guernica." 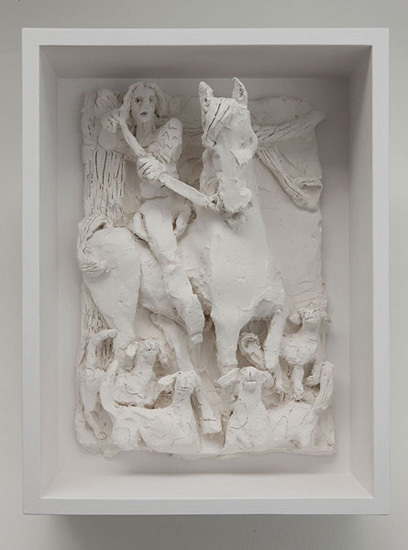 Since Roberta Smith has compared Staver's figures to claymation characters it is interesting to find that Staver actually does build ceramic maquettes for her paintings: they help her work out compositional problems and plan lighting. 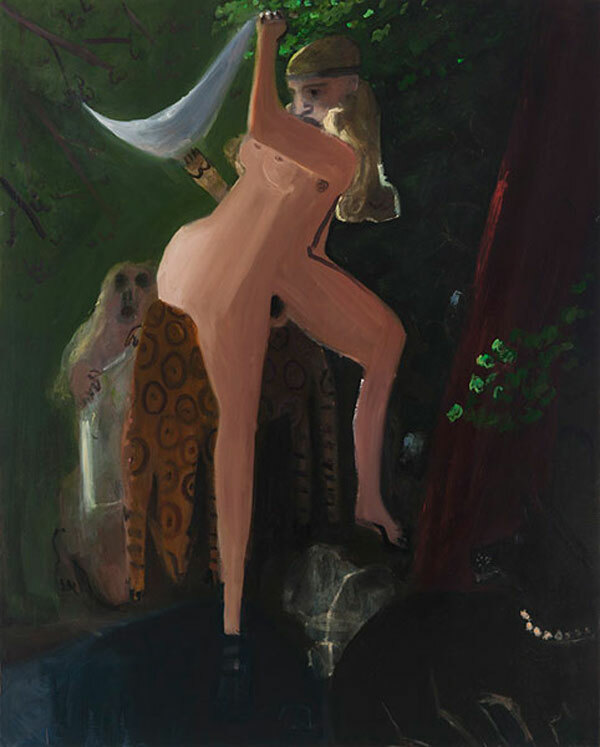 The models for "Diana and Actaeon" are on display at the Davis Gallery, and they are very revealing and charming on their own terms. By making the decision to flip into the mythological zone, Staver has joined a long list of artists -- Rembrandt and Titian for example -- whose mid-career work took on the universal and attempted to personalize and particularize. By taking on tragic themes -- as in her triptychs -- Staver says she is attempting to "up the ante" for herself as an artist. "Every once in a awhile I get in that trouble" she explains. If anything, the "trouble" seems to be that the joie de vivre in her work has been kicked up a notch, and her fantasy id has been unleashed.